After nearly a decade and a half of producing and DJing, Detroit native Terrence Dixon seems to constantly redefine what it means to be at the top of his game. I have to admit, though, I wasn’t aware of Dixon until I found last year’s stunning Train of Thought album on Yore Records. His choice of gnarled, densely textured loops was an unconventional delight which certainly stood out from all other albums, as it subtly threaded together a swath of otherwise incongruous sounds into floor-pounding and mind-warping techno tracks. Later I found out he’s been wowing fans since the mid 90’s, with releases on Utensil Records, Tresor and Background. Dixon was kind enough to briefly chat with me and lend Little White Earbuds a recent DJ set of his. It’s a bit low-fi and unfortunately I don’t have a tracklisting, but if you’re feeling cavalier, feel free to trainspot in the comments. Check out a short interview with Mr. Dixon after the jump. How did you get your start in producing? Do you have a day job as well? 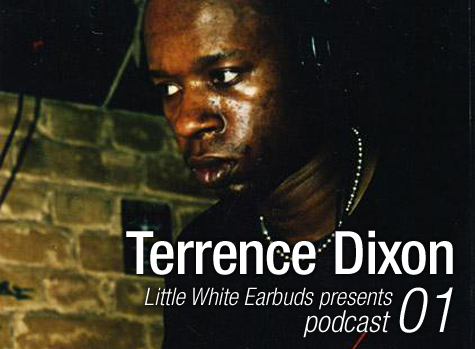 Terrence Dixon: I worked at different fast food places in the early 90’s, started producing acid over a friends house. Who are some of your biggest musical influences? What was your first techno/house record? Some of my biggest music influences are Teddy Pendergrass, The O’Jays, Mantronix and Jimi Hendrix. The first record I bought was a Mike Ink hard acid record. What gear do you make your compositions with? Alexis Quadrasynth, MC 303, Alexis MMT-8, Soundforge and Acid. When working on music, what feelings are you trying to invoke in listeners? What are you trying to accomplish with your tunes? My music comes from my surroundings and the way my life is going at the time; it’s an outlet for me that I’m glad people enjoy. What can we expect from you in 2008? More music from the heart and mind. I knew some of his work already, but know I’m in love! detroit music is the best.